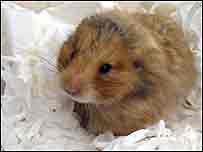 Two hamsters in cages were found thrown out with rubbish at a block of flats in East Sussex. Residents at Chadbourne Close, Brighton, found one of the hamsters alive but the other animal was already dead in the bin area near the flats. The RSPCA was called and Insp Jodie Moss took the live hamster to a vet, where it was found to be healthy. Insp Moss said: "It is outrageous that someone can just throw out a living creature in the rubbish like this." She added: "This poor hamster would certainly have died had he not been found." She said anyone with information on who dumped the hamsters could contact the RSPCA.